Anyone who loves the history of natural history will find a warm welcome. An excellent society; a compulsively readable journal and wonderfully informative, friendly meetings. The Society for the History of Natural History is a friendly international society for everyone who is interested in natural history in the broadest sense. 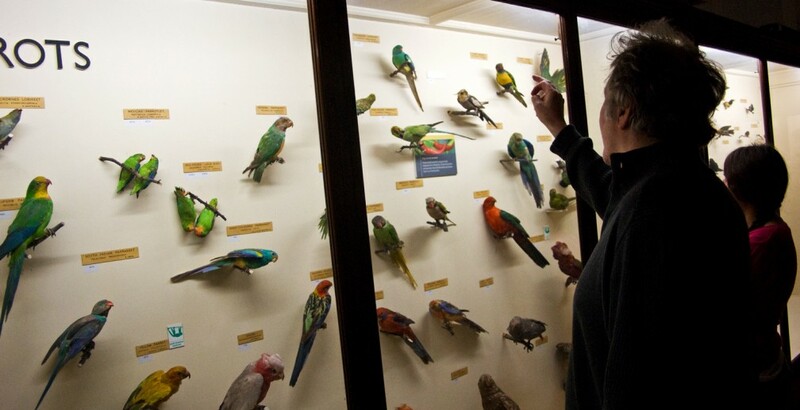 This includes botany, zoology and geology as well as natural history collections, exploration, art and bibliography. Everyone with an interest in these subjects – professional or amateur – is welcome to join. On this site you will find information about the Society, its activities, publications and how to join us. You will also find news and up-to-date information as well as links to useful resources and further information. A number of meetings and events are planned so do visit the Events pages to check on updates and more information. The membership of the Society is international and there are Representatives for a number of countries and areas. The Society organises a number of meetings and events and members receive discounted rates. Representatives also organise events in their local areas. 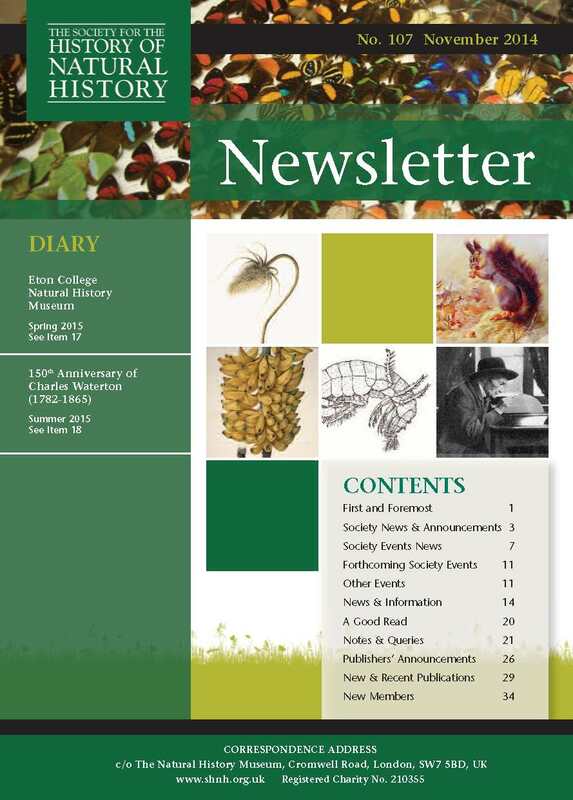 The Society’s main publication is Archives of Natural History, produced twice a year, and distributed free to all members. It contains refereed, illustrated papers and book reviews and is published for the Society by Edinburgh University Press. All 41 volumes published since 1936 are now available online free of charge to members of the Society. 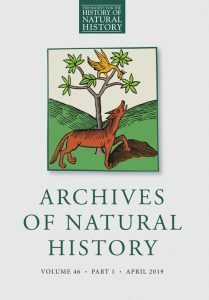 Members do not pay page charges on papers accepted for publication in Archives of natural history. An informal Newsletter is produced two – three times a year and distributed free to members. It contains details of forthcoming meetings, news of other events, a lively Notes & Queries section, members’ news and new publications. From time to time, the Society also publishes other works of interest. The most recent publications are : History of Zoos & Aquariums: From Royal gifts to Biodiversity Conservation, History & Mystery and Darwin in the Archives. Members normally receive reduced rates on the Society’s special publications. Members also are entitled to discounts on publications issued by Edinburgh University Press. Membership subscriptions are managed by Edinburgh University Press on behalf of the Society. For details of how to join the Society, please visit the subscribe to SHNH Page on the EUP website. Individual membership receives the printed copy of Archives and the Newsletter as well as free access to the on-line electronic version and to back-issues of Archives. £34 (UK); £41.50 (Europe); £46 (Rest of World); $78 (North America). Dual membership for two people living at the same address. Receive one printed copy of Archives and the Newsletter as well as free access to the on-line electronic version and to back-issues of Archives. £44 (UK); £51.50 (Europe); £56 (Rest of World); $95 (North America). Associate membership for individuals who are full-time or part-time students: proof of enrolment may be requested. Receives free on-line access to the current issue of Archives and to all back-issues, and a printed copy of the Newsletter. £11.50 (UK); £19 (Europe); £23.50 (Rest of World); $40 (North America). SHNH invites Institutions and libraries to enquire about print and online subscriptions from Edinburgh University Press. All members who have paid an annual subscription are entitled to vote at general meetings and to stand for election to Council, the Society’s governing body. They also receive all discounts available to members.